After you have registered in our Partner Program, you gain access to our system where you can follow what happens to your patients. The username is the email address you used for the registration. The password is what you gave on the registration form. Use the Log out button on the right to exit the system. Here you can see the patients registered and/or refreshed that day (the patients whose files were changed that day). 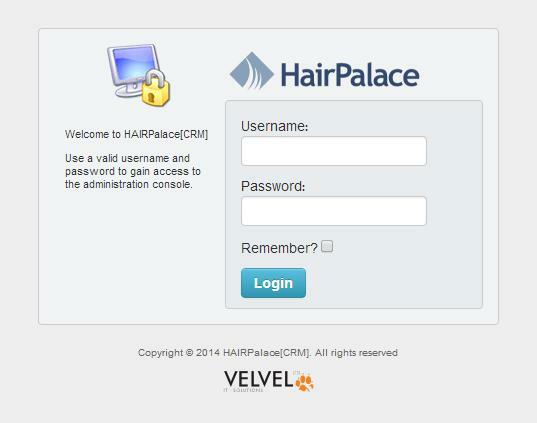 The connection between HairPalace and the Affiliate Partner’s website can be set up by using the tools generated in TOOLS Menu. With these tools, you can create an automated online money- producing system that if you set up efficiently once, it will get you money by getting you patients for months or even years. 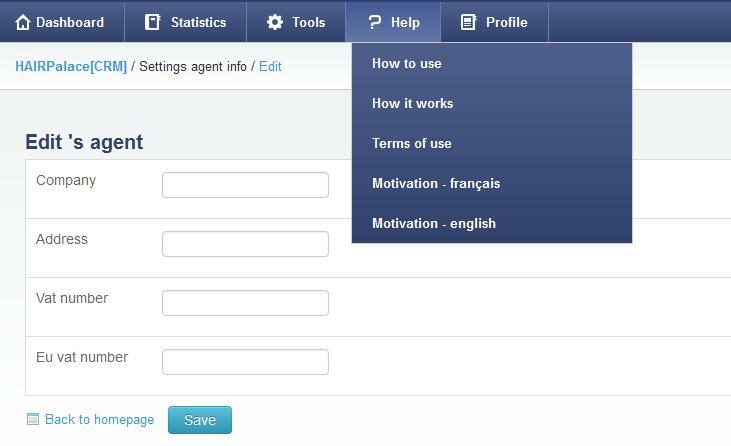 You are allowed to use the marketing tools generated in TOOLS menu since you have registered in the program. Affiliate URLs, Banners, Contact Forms, and Landing Pages. These tools may be combined too! The most efficient tool is the Landing Page combined with a Contact Form. At first, choose the language of the banner you want to generate, set the size and the landing page where you want to send your visitors. 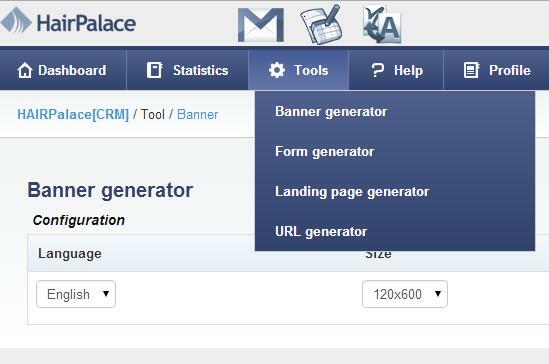 Click on Show button, choose from the generated banners, and insert them into your website. 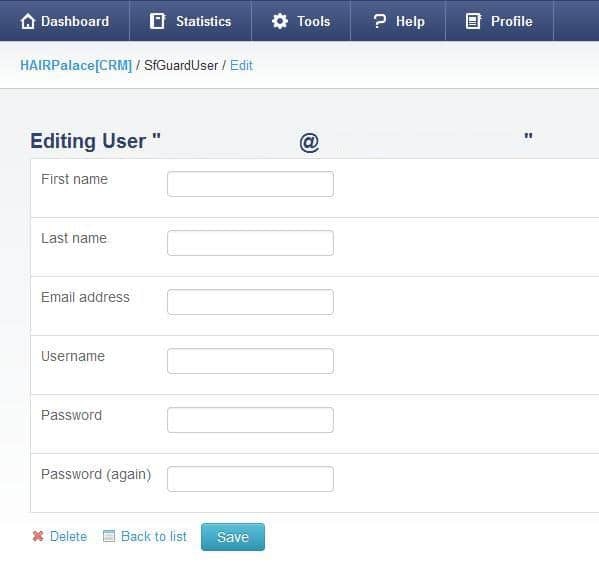 With this tool, you can easily create a Contact Form, where your future patients can automatically register. This is one of the most popular marketing tools, combined with Landing Pages. Another great advantage of generating a form is that you also can create a thank-you URL which keeps the patient on your website, thus you won’t lose the visitor after the registration. Choose the language and the Landing Page you want to send the visitors to, then insert the codes into your site following the instructions! With this tool, you can simply generate an entire page that helps you get new patients easily. We created these pages using our best and most efficient pages, thus you can be sure that they will bring you success! Choose the language of the page you want to generate. Insert the code on the right into your website! It is useful to put a Contact Form at the end of the Landing Page. These two marketing tools are the most efficient if you use them together. 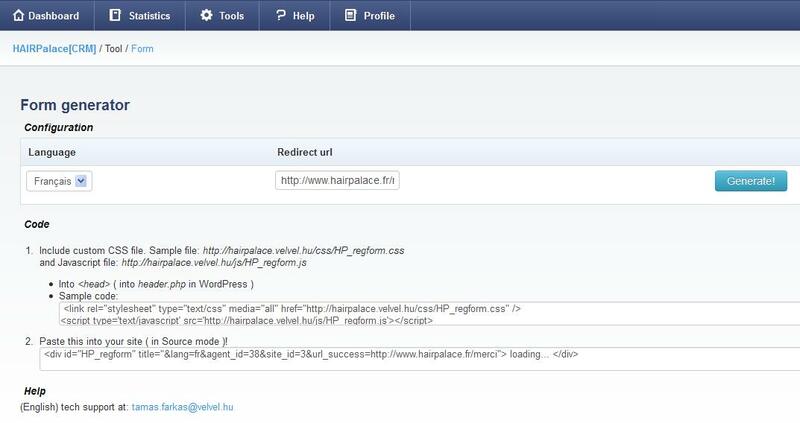 Create text links easily. 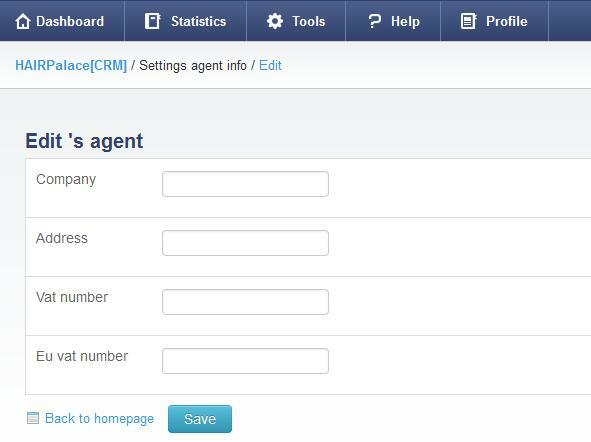 As the link contains your Agent Code, the patient will be automatically scheduled under your name in our system! Choose the consultation city you want to promote, and then insert the code into your site. Replace LINK TEXT with the text you want to put the link on! Choose an interesting phrase you also would click on. There you can find the detailed description you are reading now about the use of our system. 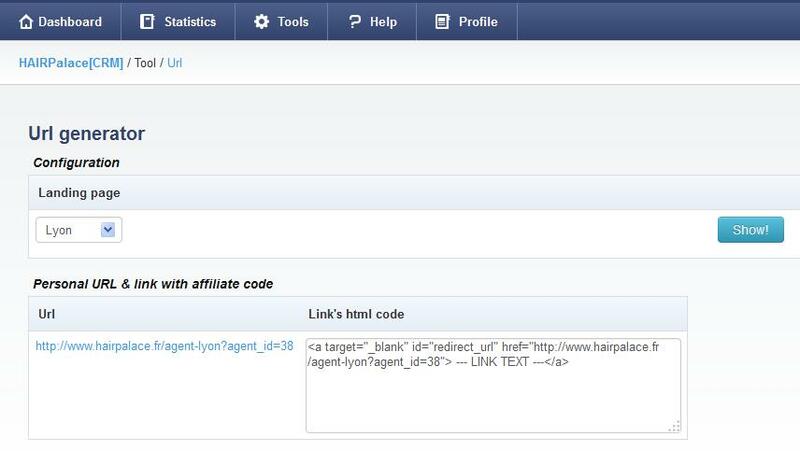 We present you step by step how to insert the tools needed for the partnership into your site. To open this description, click on How to use? in Help menu. To better understand how our program works, we created a detailed flowchart that guides you through the whole process. Click on How it works? in Help menu to open the flowchart! Know more on why it is worth to participate in our partner program! To open the page, click on Motivation in Help menu. Choose your language (the document is available in English and in French). 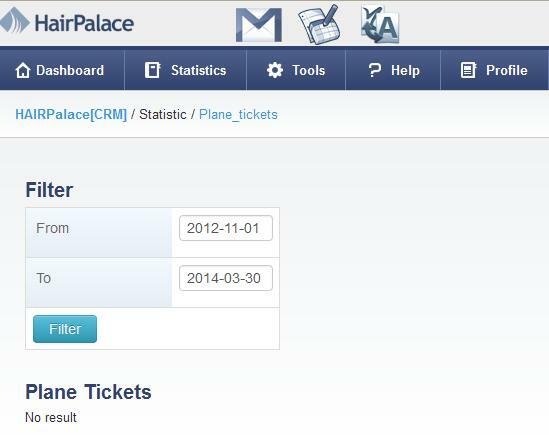 In Profile menu you can verify or change the details of your registration and agent account. Here you can change your first and last names, your email address, your username and your password. Click on Save button to save the changes. Here you can modify the name of your firm, its address, VAT number or EU VAT number. Click on Save button to save the changes. 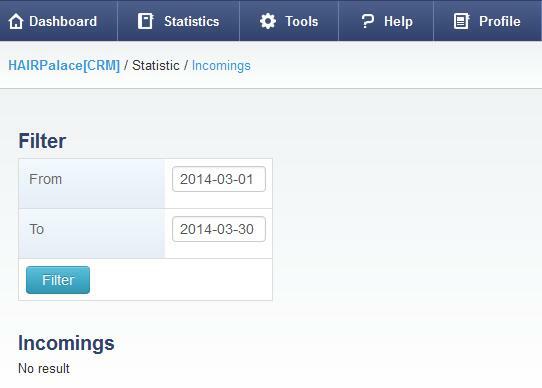 In this menu you can find several statistics that help you to follow the number of patients who registered via your site and what happened to them during the process. You can search according to several aspects, thus you get detailed statistics about the results! In this statistics you can see if your patients reserved appointments to a consultation. You can filter by date, consultation city and/or nearest city. Click on Filter button to see the search results! Here you can see how many patients have registered via your website between the chosen dates. 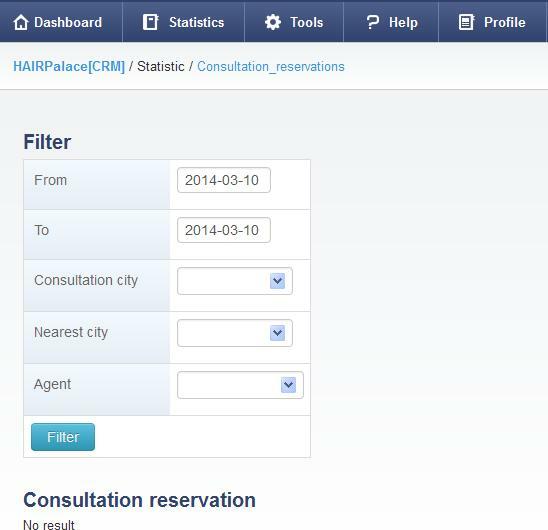 You can filter by date, consultation city and/or nearest city. Click on Filter button to see the search results. Here you can verify your incomings at a chosen period. Here you can check the number of patients who sent us plane tickets (who decided to do the treatment at our clinic) between the chosen dates. 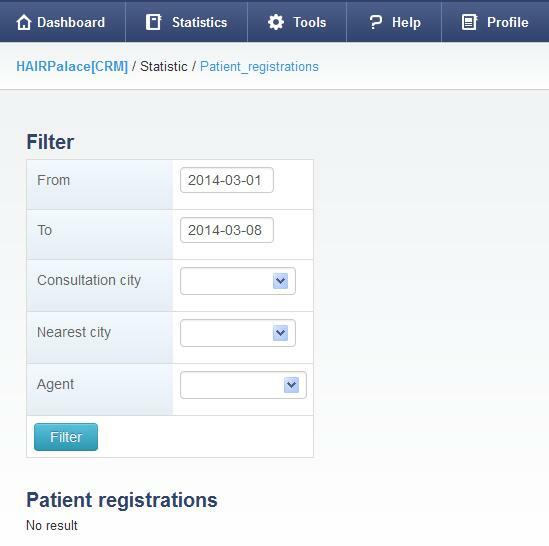 Every patient registered in our system has his/her own file. Our colleagues can follow every step that happened to the patient in this file. On the above picture, you can see the data we see in a file. The basic data are the patient’s name, phone number, email address, language and the nearest city. In Staff menu you can see the colleague who follows the patient’s file. In Source menu you can see the Agent who registered the patient, and the website where he/she came from. Under Events you can see what happened to the patient. In Status and Reminder menu you can see the patient’s status, and the date when we will contact him/her again. If the patient has already one or more treatment plans, you may see them in Proposals menu. Under Consultation you can see the city where the patient wants to go to a personal evaluation, and the date of the consultation, if he/she has already booked an appointment.